“the best thing about being an adult is the ability to buy candy wherever and whenever I want to”. Boom. So…yeah, I now like Ryan Gosling. Add me to the list that includes all the women I know, except my wife who claims he’s too shrimpy. I don’t know what she’s talking about, I was completely lost in his eyes during “Drive”. These are exactly the same kind of confection as Haribo Primavera. It’s a …spongy, chewy delight that starts off solid, but breaks down nicely. 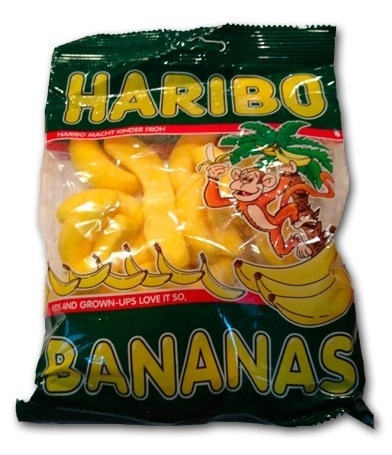 The banana flavor is full and authentic, and not without the requisite Haribo tangy edge that makes their candies so addictive. Normally I don’t like banana anything, including bananas. They’re just too one note- too sweet. But…I ate this whole bag in two sittings. And it was a huge bag. And I got a tummy ache. And it was worth it. Due to the constraints of doing these reviews on the beach, I can’t use our fancy-dancy ratings tool. But I’ll give these a solid three and half stars- absolutely worth buying if you ever come across them. And I like to think that Ryan would enjoy these after stepping on a bad guy’s skull repeatedly, or after schooling a doofus on the finer points of being suave. Or after smoking crack in high school- that’s the stuff! Where can I score a bag of these in the US? Where can I buy these other than Amazon? I love these and used to by them at a Europe Grocery store in Jacksonville Fl. but they don’t carry them any more. I also like the Strawberry. 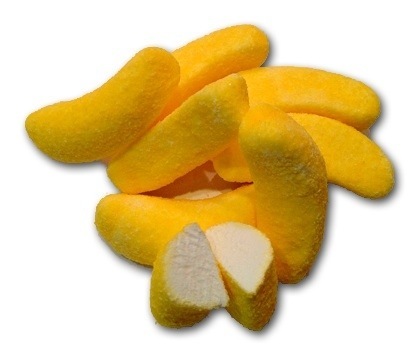 Please help me I am craving them.